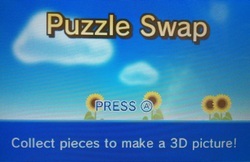 Puzzle Swap is one of three free games that are installed on every Nintendo 3DS. This one happens to be my personal favourite of these games. The 3DS has a pedometer built into it (I absolutely adore that) and, until you’ve taken one thousand steps in a day you are given one play coin for every hundred steps you take. One way to spend these play coins is to use them in Puzzle Swap in order to get new puzzle pieces for various pictures. The pictures are all scenes from various Nintendo games such as Skyward Sword and Donkey Kong Country Returns. That might sound a little boring, but once you have all the pieces of one of the pictures it then becomes a moving 3D diorama or in some cases even a short looping 3D movie to watch and these are lovely. The 3DS’s 3D effect works very well on them all and only one or two of the many pictures are disappointing. But you can’t get all of these puzzle pieces just by spending play coins. To further encourage you to carry your 3DS around with you, there are rare pink pieces (the rest being blue) which are harder to get. Normally, you spend two play coins and a little bird will swoop down to your Mii and give him or her a puzzle piece (a random one, you might already have it) but this bird will never bring you pink pieces. Every time a new picture is released (and it is updated fairly regularly at the moment) you are given one piece of it at random. This could be a pink one. Then, every time you pass somebody on the streets, your 3DS detects this and you can then meet the owner’s Mii in Puzzle Swap. When you meet another Mii you can choose to have your own copy of any puzzle piece they have, but only one per visit. It’s through the passing of others that you get the pink pieces and if you never take your 3DS out with you, you’ll never get to complete any of the pictures. While this is a lovely free game, I have to say it’s not really something you can just sit down and play. You can only make a certain amount of progress each day and so you’re only likely to use this for about five minutes a day while you get your daily pieces. But as a free game, I certainly enjoy this a lot and find it quite addictive. It also has an excellent ‘walking along’ type theme tune. Buy a 3DS (which will have this game built in) now.